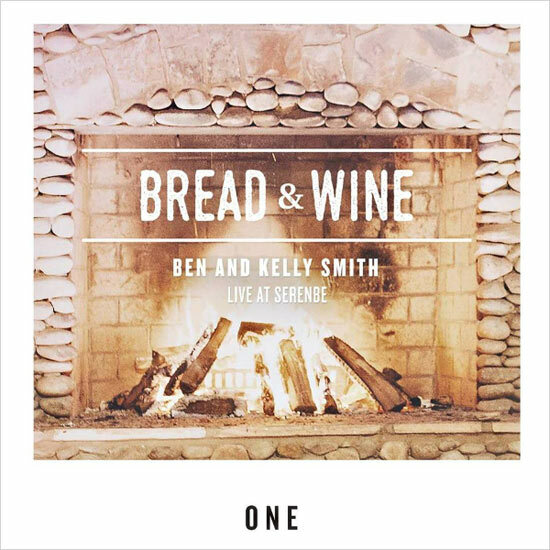 ATLANTA (September 14, 2015)- Bethel Atlanta Worship Pastors Ben and Kelly Smith who helm the group Bread & Wine anticipate the release of their powerful and passionate debut worship CD, One - Live at Serenbe on September 20. Fans of Bethel style worship music will resonate with the innovative project which features songs co-written by Ben Smith and Daniel Bashta, the writer of the certified gold selling "God's Not Dead (Like a Lion)", Jason Upton ("In Your Presence" "Fly") and Pat Barrett ("Good, Good Father"). The project was recorded live with the participation of ardent worshippers from across the region at the beautiful Lake Pavillion at Serenbe, a progressive urban community south of Atlanta last winter. Three videos have been released in the last few weeks on Youtube, the warm and poignant "Whisper" https://www.youtube.com/watch?v=SHvnBLhfTYk co-written with Jason Upton, the intimate, heartfelt praise hymn "Great Is the Lord" https://www.youtube.com/watch?v=UgzeXBxuD_E featuring Kelly Smith on vocals co-written with Daniel Bashta, Barrett and Smith and the powerful,danceable anthem "When You are Here" https://www.youtube.com/watch?v=kvi0hoPrqdM. The video of"Coming Alive" is due to be released this week, followed by the moving "Mountain to Valley", profound "Never Met a Father" and uplifting "Seek First" in subsequent weeks. The release will be celebrated by a return to Serenbe, located at 10950 Hutcheson Ferry Road, Palmetto, Georgia on Sunday, September 20 at 6 pm with the first of a series of Bread & Wine worship events open to the public. "Our hope is that this music will serve those who are seeking deeper connection with God. We want to create space for people to experience Him through communion - authentic conversation, worship, and connection with friends and family," says Ben Smith. Four Bread & Wine events are planned over the next year in the Atlanta area with the potential to take the full scale yet intimate events to other cities across the nation. Bethel Atlanta (www.bethalatlanta.com) is a church plant of Bethel Redding, known worldwide for it's music. Events will be community wide intimate worship events that will transcend and draw together worshippers from across denominational lines and regions. One - Live at Serenbe is currently available for pre-order on iTunes http://itunes.apple.com/album/id10279. until the release date. Pre-orders will receive as a bonus the immediate download of three songs: "Whisper", "Coming Alive" and "When You Are Here" .After September 20 the project will be available on all major music sources excluding Spotify. For more information on Bread & Wine visit: Instagram/Twitter/Periscope: @_breadandwine Facebook: www.facebook.com/breadandwineonline The website under construction will up around release day www.breadandwineonline.com.